What is a Mobile Rack? Official Guides of Savannah, LLC have a “Mobile Rack” ready to venture out to Savannah area conventions, meetings, trade shows and conferences. The rack can be located near the registration desk or another location that best suits your needs. Call our office at 912-238-5565 or fill out the form below to inquire if your dates are available to use the OGS Mobile Rack. We will confirm your registration by email. Since this is a subscription based brochure rack, there is no cost to you or your client for using the OGS Mobile Rack. Why would I need this for our meeting or trade show? 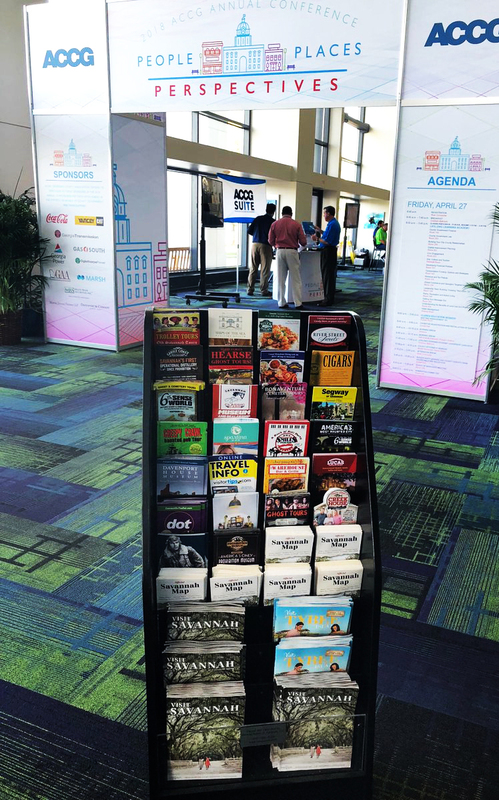 The OGS Mobile Rack will let your conference attendees have quick access to things to do, places to eat or museums to visit in the Savannah area. Call DeAnne or Laura at 912.238.5565 or email us at info@savguides.com. What venues have our mobile racks visited? What events have our mobile racks been to? Thank you for your interest in our Mobile Racks. We will confirm your registration via email.